By raising tariffs on steel and aluminium the US president has proudly delivered on a campaign promise. US steel and aluminium producers gain, but it comes at the expense of US metal consuming firms. Foreign metal producing countries also stand to lose. Canada, Mexico and Australia may be exempt from the metals tariff, turning them into winners. The overall economic impact is limited. The real threat is that the measures are a prelude to a global trade war, especially now that advisors of the US president with strong protectionist views have gained the upper hand. A new trade environment looms. US president Donald Trump signed an order on March 2 to put a 25% tariff on all steel imports and a 10% tariff on aluminium imports. Mexico and Canada are exempt pending the negotiations on NAFTA, as well as Australia as it obtained a “security agreement” with the Trump administration. The tariffs are imposed under a rarely used law that allows emergency trade sanctions for “national security.” The import tariffs are framed as a fight to preserve jobs for American steelworkers, who have seen their jobs disappear as a result of automation and globalization, as well as a matter of national security. The US administration is essentially delivering on a 2016 presidential campaign promise. The measures signal a much feared protectionist bend towards trade. They were advocated by trade hawks like Commerce secretary Wilbur Ross and trade advisor Peter Navarro. Gary Cohn, Trump’s chief economic advisor, lobbied against the tariff internally. Cohn resigned after president Trump followed through with the tariffs. Donald Trump has chosen Larry Kudlow as Cohn’s replacement. Kudlow is a confident of Trump, but has been critical about the president’s tariff hikes on steel and aluminium. The image that looms up is a Trump administration in which advisors with strong protectionist views, who advocate the types of trade measures like the announced steel and aluminium tariffs, have gained the upper hand. The fear is that this is just a start to more widespread protectionist measures, and that the rest of the world retaliates. That bodes ill for international trade. In this research note we first – to set the scene - sketch the global market for steel and aluminium. Subsequently, we analyse the economic impact of the measures on steel and aluminium for the US, its trade partners and sectors. We will argue that the impact of the measures as such is not that shocking, especially now that Canada, Mexico and Australia may be exempt. What is worrisome is that with the departure of Cohn, the US administration seems to have rid itself of any restraint to future protectionist actions. That is why the Trump tariffs threaten trade. If there is anything to characterise the steel and aluminium market, it is China’s dominance, in production as well as – though to a lesser extent – consumption. To be more precise, of the 1687 million metric tons (mmt) of steel produced in 2017, just over 50% came out of Chinese factories. Chinese consumption amounts to 44% of global consumption, suggesting an oversupply of 134 mmt of steel. Other countries shares are dwarfed by these numbers, with the EU accounting for 10% of production, Japan 6%, India 6% and the United States 5%. Steel prices have come under pressure following the global economic crisis of 2009 and China’s economic slowdown. Recently, however, prices have started to recover on the back of a pick-up in global economic growth and the announcement of the Chinese authorities that they will close down a significant number of production centres. Indeed, steel prices are now 80% higher compared to their 2015-low. US prices have closely tracked global prices and have also risen recently. US steel production shows a positive correlation with price developments. As steel prices fell in 2014, so did US production (Figure 1), whereas the recent price recovery seems to have supported US production by and large. The US now produces at 74% of its capacity. That is not enough to prevent the US from running a persistent trade deficit in steel products. In 2017 it imported 36 mmt, or about a third of its domestic consumption. This is 1.5% of global steel consumption. The main countries supplying steel to the US are Canada (17% of total imports), Brazil (13%), South Korea (12%) and Mexico (9%). Despite having an enormous overcapacity in steel, China is not a major steel exporter to the US, partly reflecting past measures to curb imports. The aluminium market is much smaller in size compared to steel, with global production of 63 mmt in 2017. As mentioned, China is again the dominant producer, with an annual output in 2017 of 32 mmt, again more than 54% of global production. Other important producers are Russia (6%), Canada (6%), India (5%), United Arab Emirates (4%) and Australia (3%). Aluminium prices have come under pressure since 2011, but, similar to steel prices, have bottomed out and are rising. This is at least partly happening on the back of the global economic recovery. US aluminium production has been in decline for decades, and took another considerable hit in 2015 (Figure 2), allegedly owing to Chinese dumping of aluminium on the US market. In 2017, the US produced only 741 thousand tons of aluminium (1.2% of global output). Current utilization rates for domestic smelters are very low at just 48%, suggesting there is plenty of potential for production to rise to meet any shortages. For now, as the US consumes approximately 10% of global production, it heavily relies on imports. The trade picture for aluminium is dominated by Canada (55% of total imports), Russia (18%) and the UAE (13%). Canada is a vital source of aluminium for domestic industries, including aerospace, construction and packaging. There has also been a rapid rise in imports from Russia and the UAE, who have helped fill recent supply gaps in the US in the past few years. If the US administration follows through with an import tariff on all trading partners, shipments of aluminium will divert from the US, pushing down prices in Europe and Asia more easily than for steel. The reason is that transport costs are lower than for steel. The lacklustre capacity utilisation rates signals that the US metals industry is exposed and only partly able to cope with the forces of globalization. US producers are not sufficiently competitive. There has been a lack of investment in new technologies, inflexible labour contracts and increasing legacy (health and pension) costs. This means that, in the case of unhampered trade between the US and the rest of the world, relatively (cost) inefficient US steel and aluminium factories are pushed out of the market. The graphs of declining US production highlight that phenomenon. Given that US production is declining and its metals consumption increasing, the US needs imports to make up for the difference. This is predominantly provided for by Canada, Mexico and Brazil for steel and by Canada, Russia and the United Arab Emirates (UAE) for aluminium. What these imports effectively do is create price convergence between the US and other countries. Such convergence is not perfect. Transport costs stand in the way of the existence of one global metals price, especially for steel, which is relatively costly to transport compared to aluminium. For the analysis of tariffs we will – for convenience - abstract from such price difference and assume there is one global price. Now, let the Trump tariffs on steel and aluminium be introduced. Leave out exemptions for the time being, we will discuss these below. Suddenly the price of imported metals in the US is higher, which at these 25% and 10% rates is a significant rise. This provides protection for US metal producers. They can theoretically raise their prices by the same percentage as the tariff without losing market share. But they are unlikely to go that far as they want to drive foreign firms out of the market. That can only be done if the price that foreign steel producers face in the US market is lowered. Such is only the case if US producers do not pass on the full tariff; foreign producers receive the US price but have to pay the tariff and thus get the US price minus tariff. Then, with the price increase in the US market for metal, US firms will be able to increase their production, replacing imports. This will not be a 100% substitution, the reason being that the higher US metals price will reduce demand from metals consuming industries such as automobile and appliance firms in the US. 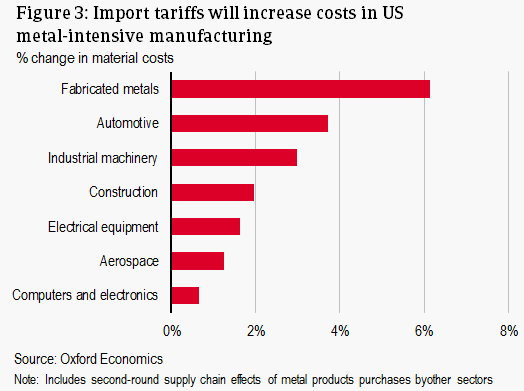 Therefore, the US will end up with higher metal prices, but lower than the (old) import price plus the tariff. Taking the steel tariffs implemented by the Bush administration in 2002 as a benchmark, the steel price can be expected to go up by 21%. Metals consumption will be lower, US steel production higher and metals imports lower. This implies an underlying price (ex-tariff) decline of slightly more than 3% for steel. This is the estimated price pressure steel producers in the rest of the world are facing after the tariff levy. Along these lines, a price decline of 2% for aluminium can be calculated. This seems a benign outcome for the US, at least if nothing else changes. One would even be able to argue that the US benefits as steel production increases and imports decline, a clear case of a GDP push. Unfortunately, matters are not that simple. Large parts of the US manufacturing sector, including fabricated metals, automotive and industrial machinery, use metals as an input in production. Their production costs will increase (Figure 3), which will erode competitiveness against foreign firms or lead to higher prices, thereby reducing product demand. 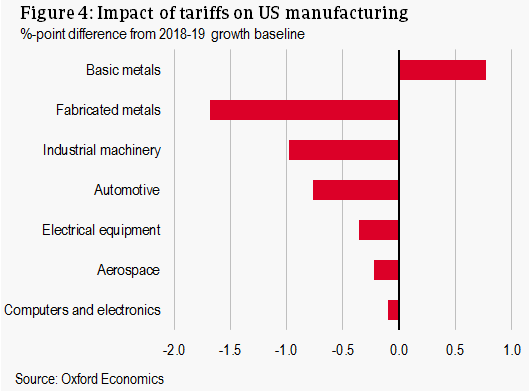 Oxford Economics has calculated that for total US manufacturing, the tariffs shave off 0.2% of growth versus a baseline scenario without tariffs. For employment the picture is even bleaker, a projected loss of at least 80,000 in the metal-using manufacturing industries over the next two years. These figures stand against a 0.8% higher growth rate and a gain of 10,000 jobs in the metal producing manufacturing sector. The US as a whole then stands to lose in terms of GDP. This is because the decline of production in the metal-using sector outweighs the production increase in the metal-producing sector; the metal-using sectors are larger (40% of US manufacturing output versus 4% of metal-producing sectors). However, the impact on the total US economy is not likely to be large. For example, the 2002 tariffs on steel resulted in a negative impact of USD 30 million, a negligible share of total US GDP. The overall loss of 70,000 jobs in the manufacturing sector seems somewhat more substantial, but compared to total US employment (148 billion in 2017) the effect is negligible. We also wish to point out that the US government stands to gain from the tariffs, marginally. With metals imports amounting to USD 28 billion in 2016, the tariffs may lead to considerable import shrink. Although the price may be expected to go down, for steel by 3% and aluminium by 2%, the government will be able to generate USD 5.8 billion in tariff revenues. Tax revenues will be slightly lower as steel producers increase their margins and volumes, to be offset against lower margins and volumes from firms that use steel as imports. The latter, losers of the tariffs, will face a lower tax bill. The overall amount of tariff revenues is negligible though in view of the total of USD 6.3 trillion that the US expects to collect in taxes in 2018. As we have seen, foreign firms receive the US metal price ex tariff. This comes out lower than the US price prior to tariff levy. Such has an impact beyond the US market, because – barring transport costs – there is one price in the global market. The lower price will provide some impetus to demand in the rest of the world, which partly compensates the reduced exports to the US. Still, the overall effect on America’s trading partners is negative. Countries that stand to lose most are the ones whose steel exports to the US are a large share of their metals production. On the assumption that no exemptions are granted, the most affected countries are Canada, Mexico and Brazil. In 2016, 88% of Canadian steel exports went to the US, while the figures for Mexico and Brazil were 73% and 34% respectively. Is it all that bleak for all firms in these countries? The answer is no. The metals exporting firms, they obviously lose. But not necessarily metals producers in the rest of the world; if these firms have production facilities in the US, and some have, they even stand to benefit. Moreover, there are also metal using firms, such as automobile and appliance firms, which now have a windfall of a lower steel price, improving input costs and margins, and even their competitive position. They can even start, or accelerate, exporting to the US, where metals exporters face higher costs as we have seen. With the impact on US GDP already so low, the impact on GDP for the rest of the world, or even Europe alone, should be marginal and may not even be detectable in GDP data. An impact on global GDP will hardly be perceivable. The above analysis is based on full tariffs imposed on steel and aluminium, with no exemptions. This is an abstraction. At least Canada and Mexico were granted an exemption pending NAFTA negotiations, whereas Australia obtained an exemption based on a “security agreement” with the US. More countries may follow. Canada and Mexico are particularly important players on the US metals market. Canada and Mexico together hold 26% of the US steel market and Canada has a market share of 55% of the US aluminium market. The question then is how the analysis above holds when such a significant portion of the exporters are exempted. To evaluate this, we may want to return to the starting point of the tariff levy and the inclination of US firms to raise prices, margins and expand volumes. As the US steel and aluminium prices go up, Canadian, Mexican and Australian metal firms can opt for broadly two strategies. First, they can sell at the new US price, and expand their production. This would make it more difficult for both US production and imports from non-exempted firms to increase. The Canadian and Mexican firms have, from an economic point of view, effectively obtained US firm status. This line of action will push metals prices to a lower level than without the exemption due to the increased supply from ‘US’ firms. Second, these firms can, provided they have sufficient capacity, initially sell at the ‘old’ or pre tariff prices, and obtain massive market share gains in the US market. However, this will not prevent US metals prices from being driven upward (unless supply from Canada and Mexico fully replaces the imports from the non-exempted countries). The price increase in the US market will be even more limited in such case. The upshot of the exemption in our framework is then a lower US price, of which the level depends on what firms from the exempted countries can supply. The lower the price, the more limited the US production expansion, and thus the perceived impact of the tariff. Indeed, exemptions are potentially a powerful weapon to undermine the US tariff. Moreover we can state that, the more exemptions, the weaker the ultimate impact of the tariffs. Exempted metal exporting countries, however, stand to gain. The US administration, or perhaps the US president, has made a big point of delivering on a campaign promise of raising tariffs to reinvigorate the US steel and aluminium industry. US president Donald Trump leaves no opportunity unused to Tweet about this. This, as well as the measure as such has created great upheaval and raises fears of what is next. In this research note we have focused on analysing the impact of an across-the-board tariff on steel and aluminium. This leaves three key uncertainties. First, the US administration is willing to negotiate exemptions with countries (other than Canada, Mexico and Australia) and with individual firms. Second, trading partners subject to the import tariff are expected to retaliate, and have vented various alternatives in anticipation. The EU has prepared a list of American exports it would hit with a “reciprocal” 25% tariff. It includes the iconic American brands Harley-Davidson, and products such as bourbon and blue jeans. Trump has said that he would meet such a response with tariffs on cars. China has announced “strong” measures to protect its own interests if the US follows through with the import tariffs. Third, apart from exemptions and retaliations, the US government is likely to come up with more widespread protectionist measures. This solicits additional countervailing measures by its trading partners, which could end up in a trade war.